Since Hope and Change has our household budget much tighter, I can’t donate money to the cause like I used to (and not that it was ever much). Last year I agreed to run an ad gratis, for a few months, for the Civil Rights Defense Fund. I said I’d do it for a few months, but I left it up for a good bit longer. Though I still support what they do, the fact is if we need CRDF in the fight before us, it means we’ve already lost, and are going to be depending on the Courts to save us. So I’m, switching gears a bit to help drive membership, which is going to be more important in the upcoming fight in legislatures. I’d love to hear “No, NRA represents 5 million members now,” being spoken through the Halls of Congress and State Capitols. Hell, I’d like to say 10 million, but we get there bit by bit. 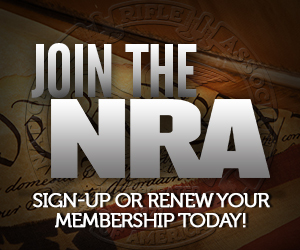 So I’ve replaced the CRDF banner with one to encourage folks to join NRA. The banner will remain up until this crisis passes. No matter what you may think of the organization, they are who the politicians pay attention to. If you don’t like NRA compromises, help make them stronger so we do not end up in a position where one is forced on us. I had planned on upgrading to a life membership this year. Instead, I renewed my current membership , and donated the difference to the ILA to bring the fight to the congress. I signed up three new members over the holiday. I’m doing my part! A person I know is very anti-gun. They live in a foreign country, and are in the process of giving up their US citizenship because they feel that a free (to them) education and free (to them) health care is what they are entitled to. I am pretty sure that they are getting an NRA membership for their birthday from me…. Absolutely. If you’re not a part of the NRA, you’re not a part of this fight. Just signed up a friend today. I have been disappointed with the NRA’s response so far, but increasing their membership is one of the cheapest and easiest way to demonstrate the number of firearms owners who are willing to fight politically. Hmmm, they’ve already changed the national “conversation” to include putting armed guards in school, which I count as a plus, especially since high profile opponents like the now infamous “felon on national TV” David Gregory puts his children into a school with 11 guards before you count the additional protection from the Secret Service for Obama’s kids. The Left considers “hypocrisy” to be a debate ending tactic, it’s nice to be able to make them squirm, and their arguments that armed guards would be of no possible benefit aren’t selling well. I’ll keep my membership (I’m supposed to for my club membership anyhow). I know nothing about the politics of the GOA, but Pratt did a far better job debating and sticking up for gun owner rights.